Up to 21 hours of knit and crochet classes. Pick the classes you want! The Opening Day presentation on Thursday morning. Reserved VIP seating at Teacher a la Carte lunch. Front row reserved VIP seating at the Fashion Show. Reserved VIP seating at the Fashion Show dinner. Reserved VIP seating at the Student Banquet & Style Show. Full access pass to the STITCHES Market throughout the weekend. 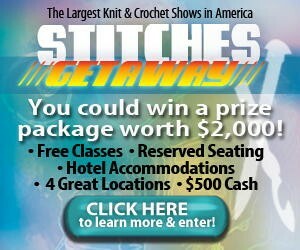 Entry is to win a “STITCHES Expo Getaway” closest to your home. 5 nights hotel accommodations at the host hotel including hotel room taxes! The sweepstakes ends on February 23, 2016 and each person can enter once daily. Each entrant must be 18 years or older at time of entry. Click here to enter the Stitches Expo Getaway Giveaway. Good luck as always and if you win let us know, and have fun!! Share the post "Stitches Expo Getaway Giveaway"